Bulls fans aren’t the only ones who have noticed Derrick Rose took a while to get back from his ACL injury and now he’s injured again. Sacramento’s DeMarcus Cousins shared his feelings in a backhanded way this week when asked about his own injured ankle, which he hurt during a loss to the Oklahoma City Thunder. Asked DeMarcus Cousins about playing Friday, he joked "probably not, think I'll be out rest of the season & I can get a comeback commercial"
Rose tore his ACL in the 2012 playoffs, and that summer he was the subject of a commercial heralding his comeback by his shoe company, adidas. Rose never actually made that comeback, though. While he was said to be healthy enough to play as the 2012-13 season wrapped up, he chose to rest until he was fully recovered despite his team fighting through the playoffs. 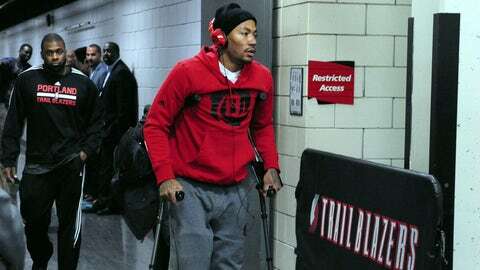 This year, when he finally took the court again, he played just 10 games before injuring his other knee. He’s out for the season. Rose isn’t the only one absorbing jabs. It’s open season on the entire Eastern Conference. The Blazers, or at least the guy who runs the team’s Twitter account, took to the social media site this week to fire off a zinger at the teams in the East. Is it too late to join the Eastern Conference? Asking for a friend. There’s really been no questioning the West’s superiority this season. Just two Eastern Conference teams have records of better than .500, while 10 teams out West have winning records. Additionally, there are five teams below .500 in the East’s top eight, while there are four teams .500 or better outside of the current Western Conference playoff picture. The joke probably would be even better coming from a team like Minnesota, which sits 13th in the West but would have the fourth-best record in the East. Either way, no one in the East is laughing. The Hawks fired back Wednesday night after beating the Clippers.